In Henry’s new church, Lent is as raw and cold as ever it was under the Pope. Miserable, meatless days fray a man’s temper. When Henry talks about Jane, he blinks, tears spring to his eyes. ‘Her little hands, Crumb. Her little paws, like a child’s. She has no guile in her. And she never speaks. And if she does I have to bend my head to hear what she says. And in the pause I can hear my heart. Her little bits of embroidery, her scraps of silk, her halcyon sleeves she cut out of the cloth some admirer gave her once, some poor boy struck with love for her … and yet she has never succumbed. Her little sleeves, her seed pearl necklace … she has nothing … she expects nothing …’ A tear at last sneaks from Henry’s eye, meanders down his cheek and vanishes into the mottled grey and ginger of his beard. observations: Cold meatless Lent begins today, Ash Wedesday, after the glories of Carnevale on Monday and Tuesday. What a mysterious person Jane Seymour is. We know nothing private about her, only the public facts of her life – beyond that is just guesswork. True of many historical figures of course, and particularly women, their lives recorded only at intervals. She is still an enigma in this book, though Hilary Mantel succeeds in making her intriguing, with the suggestion of more than can be seen in the facts. We, the readers, know that the gift of the cloth came from Thomas Cromwell himself, and that he was rather taken with her (political needs aside) – but that is all just in the book, it’s not history. 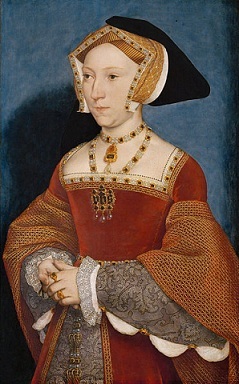 What history does show, is who, surprisingly, married Jane Seymour’s sister Elizabeth as her second husband…. Ages to wait before the 3rd book of this trilogy is published: but we look forward to seeing how Jane is dealt with. She does seem to have worked hard to reconcile her husband with his children from previous marriages, which would show a kind heart. Links on the blog: Wolf Hall and Bring up the Bodies have both featured several times. The lovely Topaz in I Capture the Castle probably doesn’t often get compared with Jane Seymour, but she WAS a great stepmother. The picture is Hans Holbein’s portrait of Jane – there are few images of her in existence. Holbein is a character in the novels. So hard to remember what's just in the book, not history. I haven't read this yet, it's a treat to come. Moira - It's so interesting to speculate on what Jane Seymour was like I think. She really was an enigma.